Cypresses twist up dark green against hot blue sky. 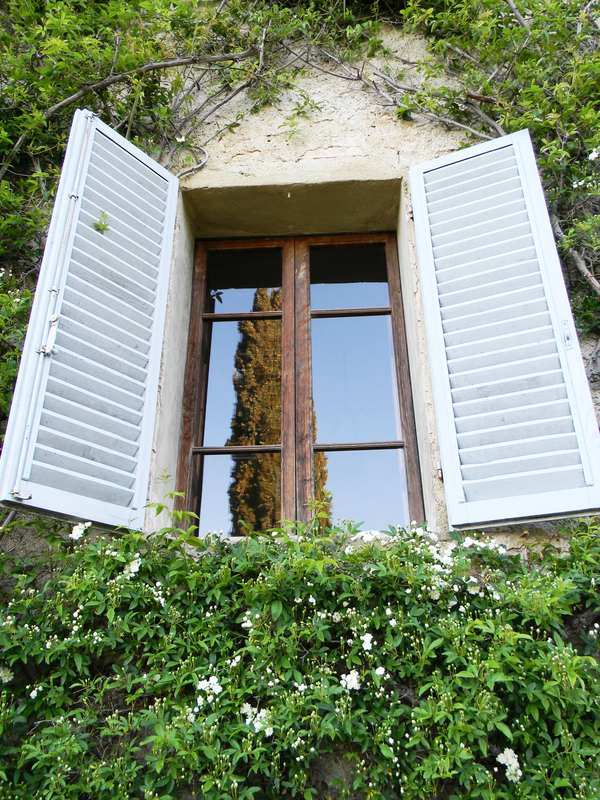 It’s full-on summer and the sun shines maniacally over the legendary Tuscan Hills. We are ecstatic to be here. Rolling green provides the lull we are looking for and our tiny Fiat 500 provides the zip. 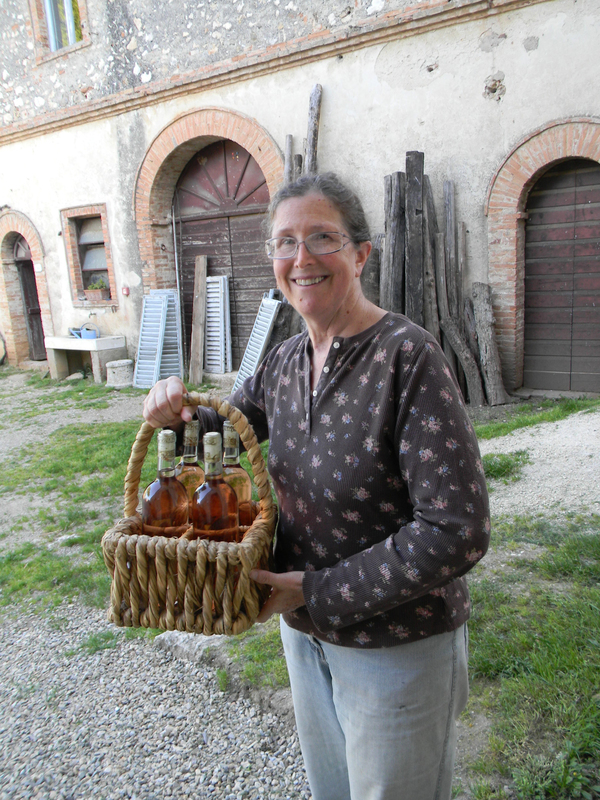 We make Spannocchia in a couple of hours and crunch up the last two kilometers of driveway in happy anticipation. We climb the ancient stairs to Room 5 with its deep marble tub and barrel-shaped ceiling. It feels like home. Our evening at Spannocchia is a quiet feast of ribbolita, a hearty bread soup that is tasty despite its humble origins (stale bread). Chef Graziela nails it again with a cheesy gratin of baked leeks. 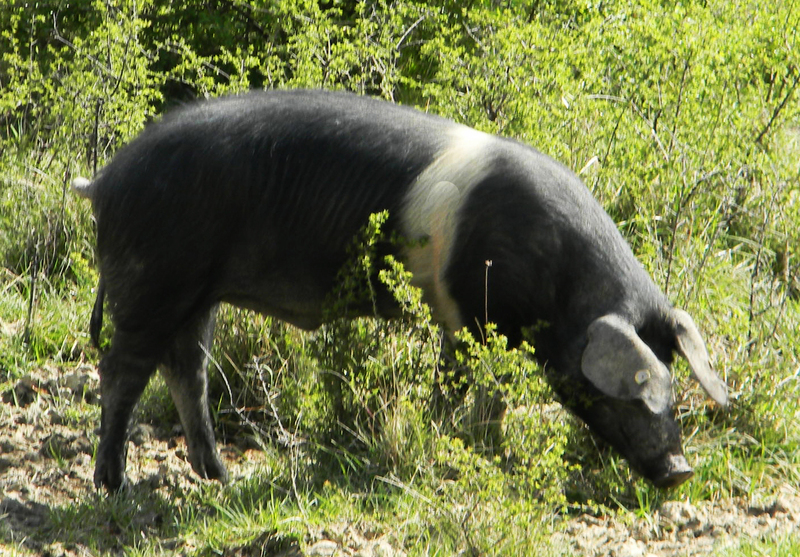 The tenuta’s black and white Cinta Sinese pigs snuffle the grounds in harmony with nature, up to and including their “transformation” which in Spannocchia parlance means butchery, a soothing euphemism delivered without a trace of irony. Our giddy night continues with a trip into Siena to meet our friend Doug Mack, Vermont’s godfather of Slow Food. We surprise him as he orders espresso at ristorante Bagoga. He kindly offers us a glass of Chianti and says we have blown his mind. Good. That was the idea. We return to Spannocchia after midnight and not even Lapo the sheepdog is awake. After a generous farm breakfast of yogurt, granola, bright-yolked eggs, and morning cake, we meander Chianti Country – Poggibonsi, Siena, Sovicille. 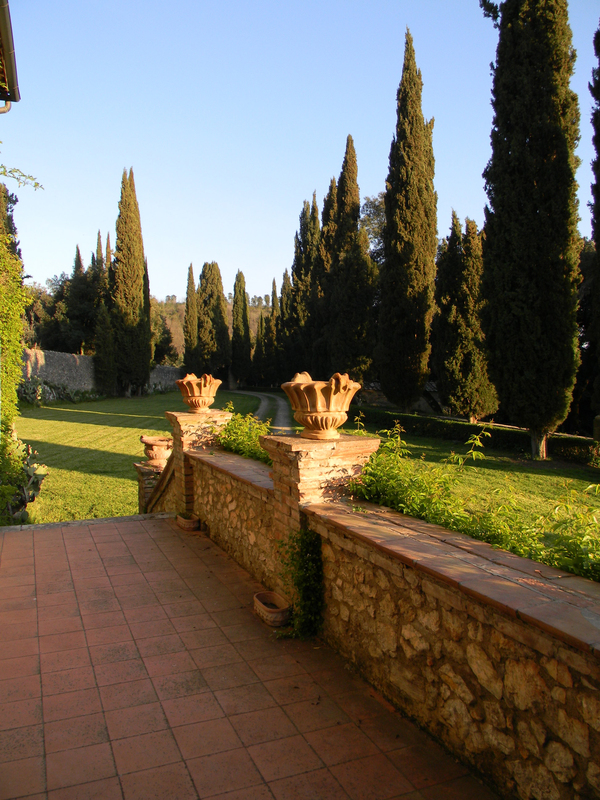 We’re wowed by the 360˚views from Casole D’Elsa. And we’re captivated by Monteriggioni, an ancient walled town recommended by our dear friend Marcel whose love of Italian history matches his nose for beauty. We are not disappointed. 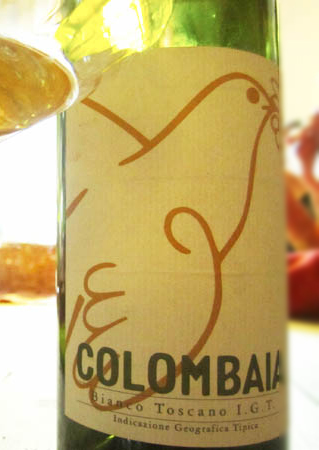 We con tinue to Columbaia, with organic wines that taste of verdant fields and Tuscan sun. Beautiful. 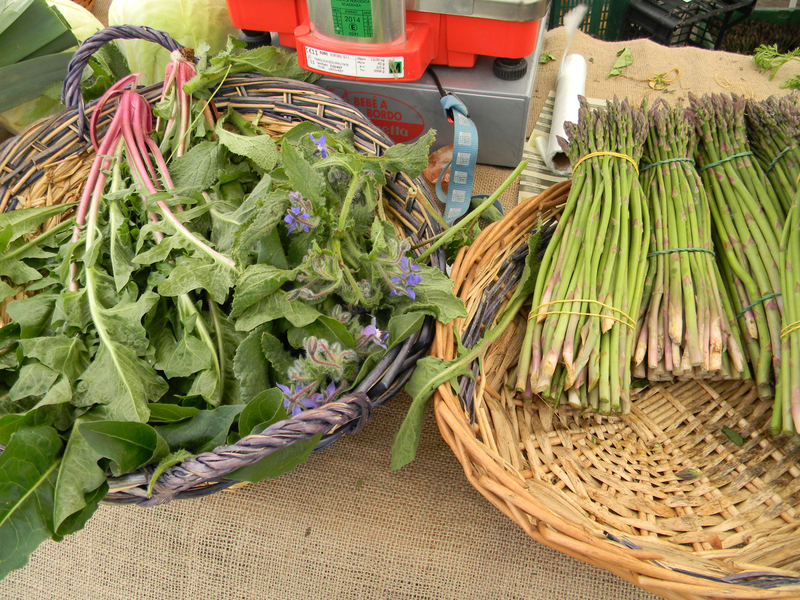 Columbaia supplies local organic restaurants. 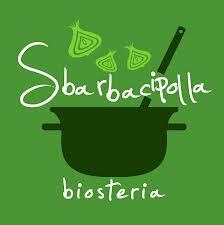 We look forward to tasting more old vines tonight at Nicola Bochiccio and Chiara Salvadori’s biosteria, Sbarbacipolla – the first of two delicious and amazing evenings we will have in Colle di Val d’Elsa. We surprise Chiara at Sbarbacipolla, a beautiful organic restaurant in the center of town. We are overjoyed. I have heard so much about this restaurant, but am not prepared for the high-level magic from the cucina of Chiara’s husband, chef Nicola. This young chef has reimagined Tuscan cuisine slow-food style, with a hefty hit of biodynamism and creativity. Whatever he’s doing, it works. 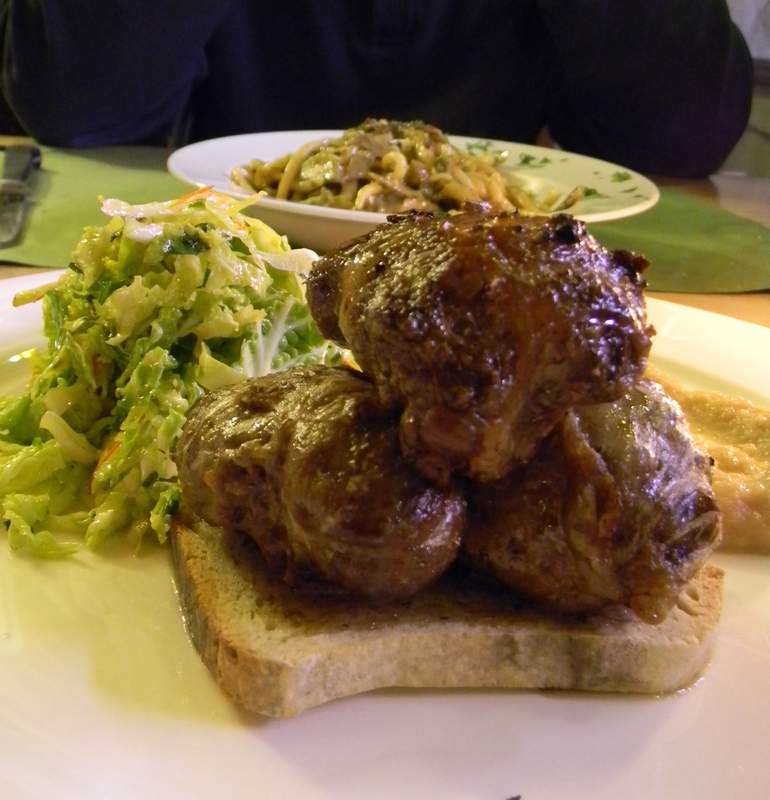 We start with chicken liver pate – salty and delicious, best ever. We move on to the famous Sbarbantipasto, an array of wildly creative bites including a cauliflower flan, pumpkin frites, local cheese fondue, red pepper hummus, pecorino al pignoleto, orzo salad, and two crostini with savory spreads, blonde and dark. Each taste is earthy, exquisite, and more than enough for two. We look up from our gorgeous plate just long enough to see that every table has ordered the popular Sbarbantipasto, and each diner is wearing a similarly rapt expression. 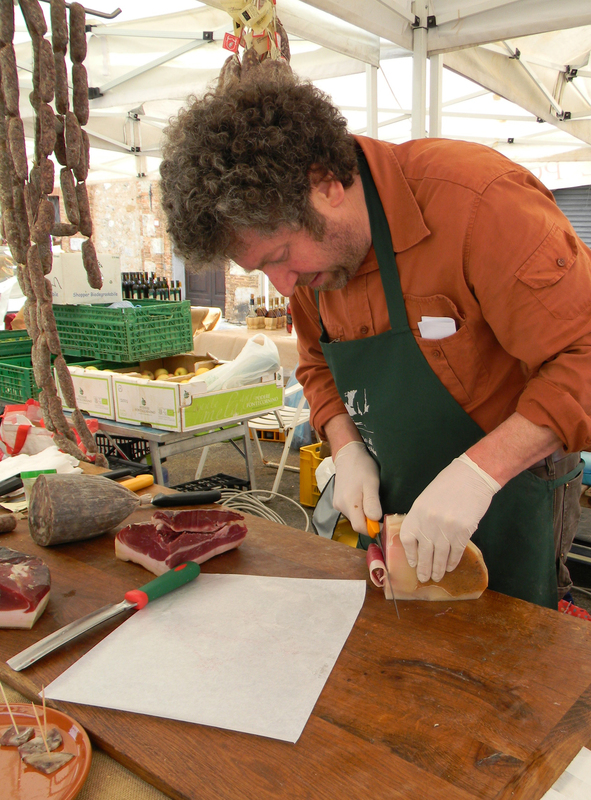 Nicola prepares Spannocchia’s Cinta Sinese pig livers with skill and a light touch. How is it possible to be so robust and so delicate? Perhaps because the pigs are so happy? It is a pleasant conundrum solved only by a return visit. A salad of radicchio, percorino and nuts delivers crunch and contrast to the unctuous, savory liver. We conclude with a nibble of cheese, drain our beautiful bottle of organic Colombaia Rosso Toscano, and bid our lovely friends Chiara and Nicola a fond arrivederci. It’s always a pleasure to return to our beloved home-base, Spannocchia, at the end of a long, full day. We spend the morning at an organic farmer’s market in Sovicille with native local products like olive oil, honey and beeswax candles in charming shapes. 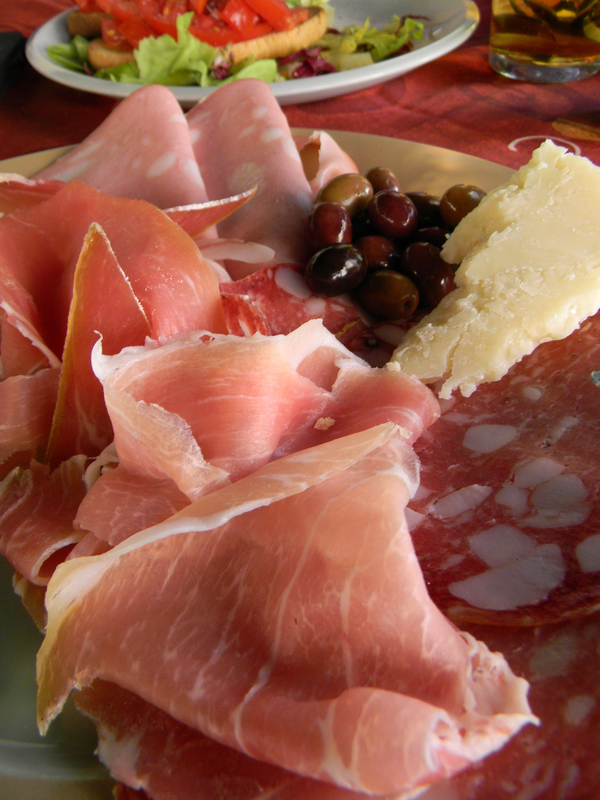 Our friend, Ricchio, has a tasty stand of beautiful pink prosciutto, cheeses and other Spannocchia products. As lovely as this scene is – forgive me – I miss the challenge of thumping urban markets where you must remember not to touch the merchandise and be aware of your wallet at all times. We make our way back toward Siena, humming along curvaceous city walls covered in tiny red poppies. Outside the ristorante Montalbuccio, a line of parked cars is a reliable indicator of good things within. We park our Fiat at the end of the line. Good call. 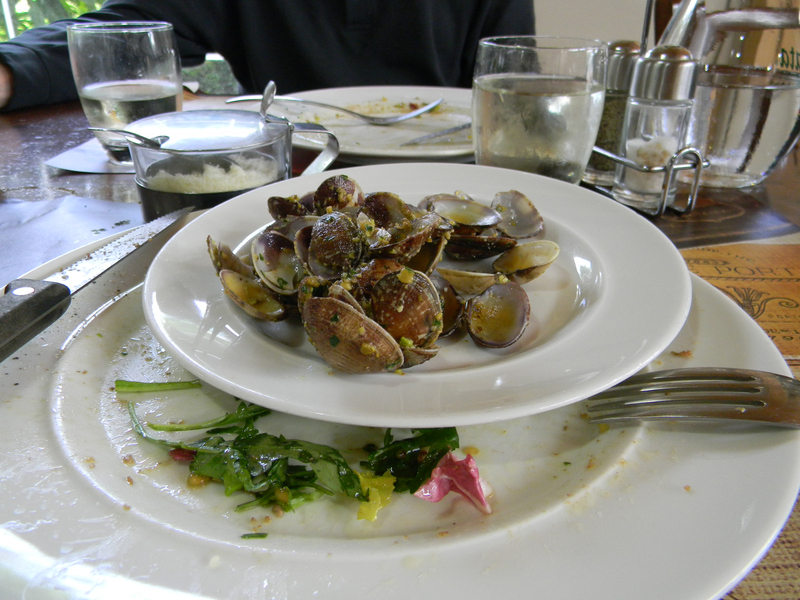 We savor pork tagliatelle, and a spaghetti vongole with pistachios. Both are delicious and unexpected. We need a nap. We climb what feels like hundreds of ancient stairs to the old section of Colle Val d’Elsa and catch our breath over Campari and soda in the piazza as we wait for Officina della Cucina Popolare to open. The late-afternoon light is yellow in this little stone-walled town, now shuttered and quiet. We enjoy the Sunday-afternoon scene of beautifully dressed babies and spinning, wheeling children. Two tiny girls in pink sit at the bar with a plate of olives, perfectly content. At 7:30 Mateo greets us at the door of La Cucina wearing a red t-shirt and apron. At his urging, we sip Prosecco, bubbly and excited, while he explains his seasonal menu. We begin with finocchiona, savory fennel-studded cured meat, and baked radiccio whose blackened bitter bite is a surprising and perfect. 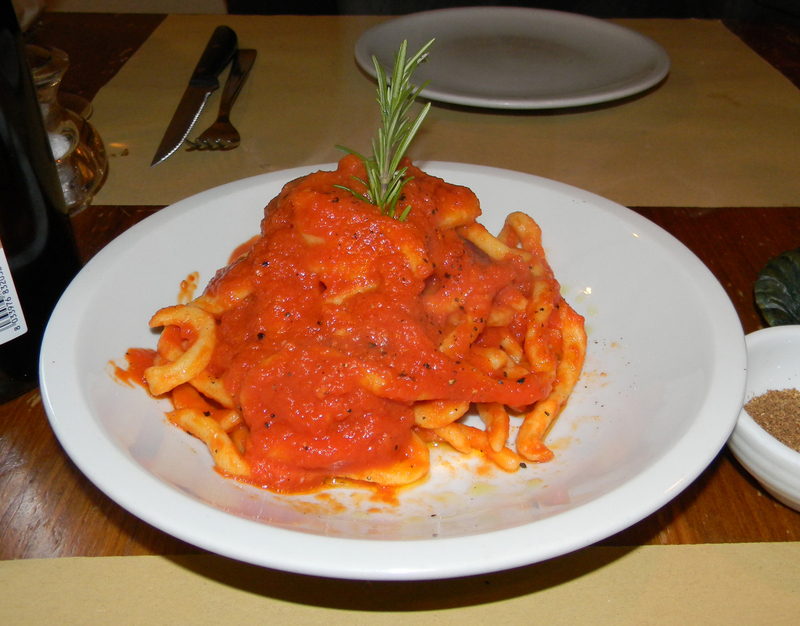 Mateo’s ultimate native pasta, “pici,” hand-rolled chubby spaghetti, is presented in a robust tomato-garlic sauce with a rosemary sprig pointing to heaven. 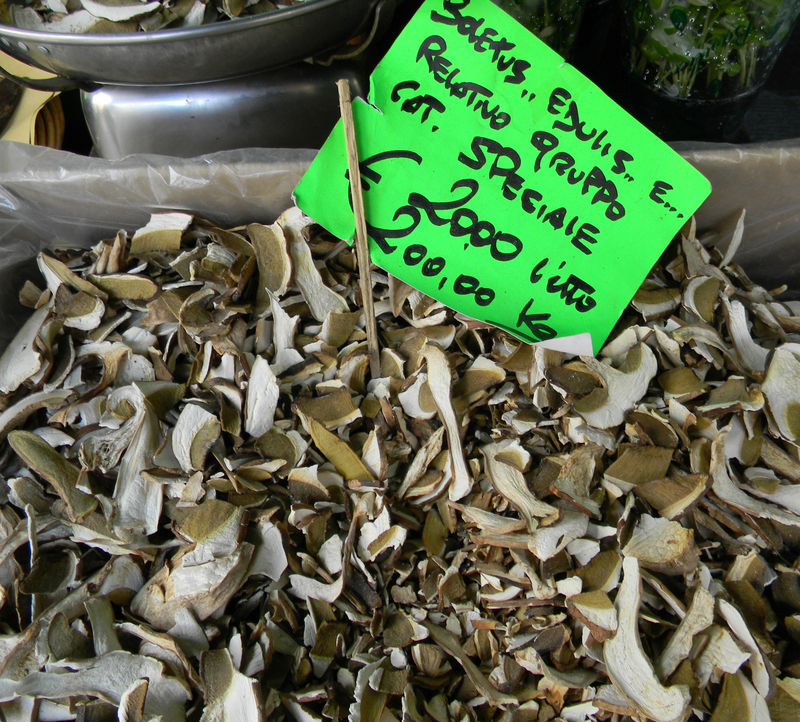 Rustic chestnut flour taglioline under traditional pork ragu is silky and rich. We finish with plate of sliced fresh pears, gorgonzola and local honey. Lingering over vin santo and cantucci, we decide this is simply perfect, ultimate Tuscan fare. I met Mateo at the first international sustainable agriculture symposium at Spannocchia in 2009 when he was a fledgling slow food dreamer. 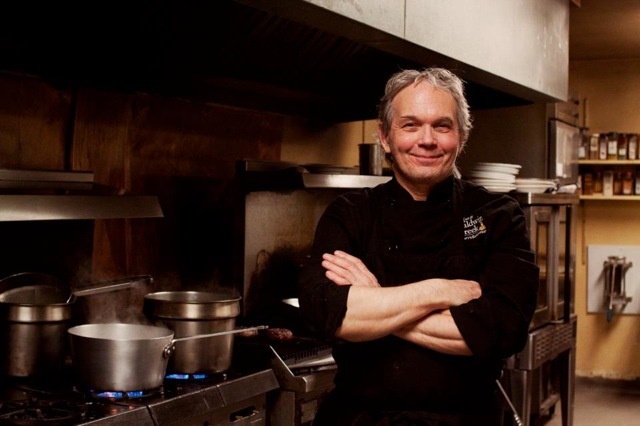 He now has one of the most popular cucinas in town and a pasta school, too. 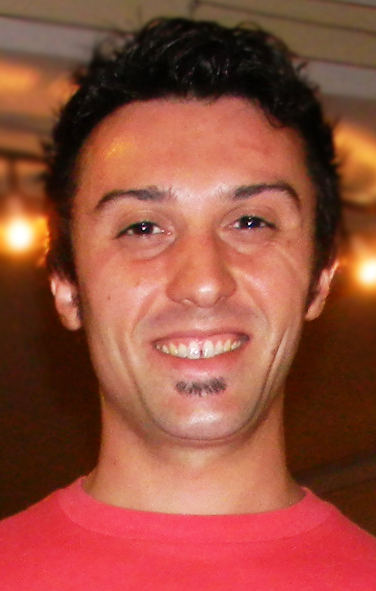 Life is good for Mateo – he and Ilaria are expecting a baby, Emma, in a few weeks. Auguri, dear Mateo! Arrivederci, Spannocchia. We head for Lucca and our tiny, mod apartment within five minutes walk of the centro. 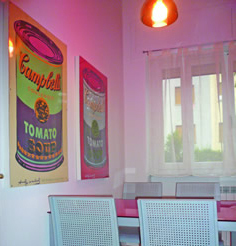 The apartment is a bargain at 65 euro/night and decorated with bright Warhol and Haring. Lucca’s dark, medieval wall is crowned with a beautiful promenade overlooking towers and piazzas inside, and grassy park outside. Best of all, Lucca is somehow magically uncrowded. Yellow tortelli with fresh porcini are best here in Lucca. Tuscan bread is unsalted, generally, but sometimes here in Lucca you will find nice crusty hunk with salt, surprise! 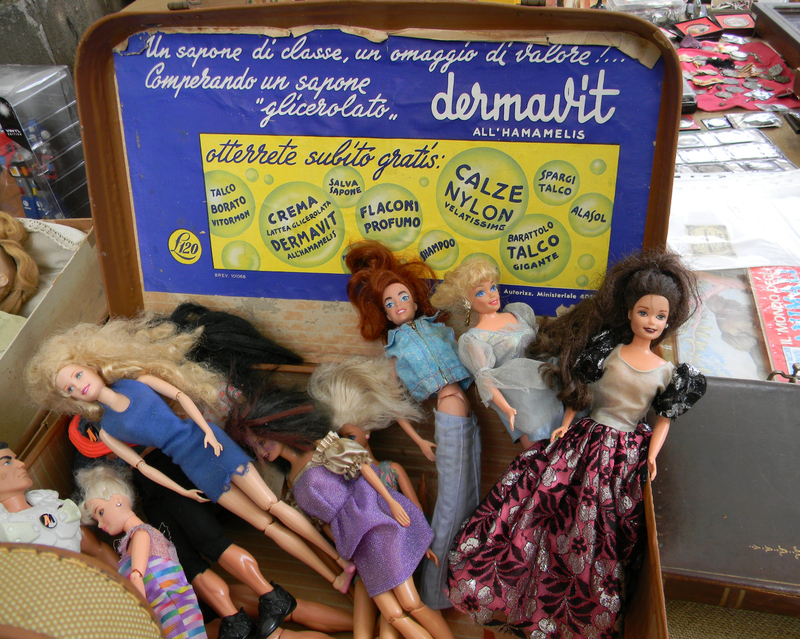 We savor a Tuscan platter of prosciutto, mortadella and a rustic shard of Parmegiano Reggiano while overlooking the city-wide antiquariato market, a bizarre festival celebrating anything “vintage” in Piazza Grande. It’s a total gas. This entry was posted in Art and Culture, Festivals, Food and Wine, International, Italian Travel, Music, Travel and tagged Cinta Sinese, La Dolce Vita, Lucca, Sbarbacippola, Siena, Slow Food Siena, Spannocchia, Tuscany. Bookmark the permalink. Another fabulous trip – what a life!! !